Paul Yeung Tak-ming (b.1978, Hong Kong) graduated from MA in Image and Communication (Photography) at Goldsmiths College, London in 2011. Yeung embarked on his profession in photojournalism for 10 years after graduated from BA of Journalism and Communication in Hong Kong 2000. He was elected to be chairman of the Hong Kong Press Photographers Association (2007, 2008). He was former part-time lecturer in Photojournalism at the Chinese University of Hong Kong and Photo-documentary in Chu Hai College of Higher Education. He had received more than 20 awards presented by The Newspaper Society of Hong Kong and Hong Kong Press Photographers Association. He was selected as one of the 14 “Hong Kong New Generation Photographers” at the Hong Kong Photography Festival 2010. He co-operates with various photographers to publish independent photography publications “Mahjong” and “Not accord with…” He participated in “Count to 12”, a part of “The Road to 2012” project commissioned by and exhibited in the National Portrait Gallery, London (2011). Yeung opened his first solo photography exhibition “The Flower Show” (2012) at Blindspot Gallery in 2012. His works also exhibited in “Post-Straight: Contemporary Hong Kong Photography” at Hong Kong Heritage Museum (2012), “The Good Old Days in 1989” at MOST (solo, 2012), IC Show, MA Degree Show in Goldsmiths College (UK, 2011), “7 Fei: Not accord with the exhibition” Photography Exhibition (2010), “North” Photography Exhibition in Upper Station Gallery (2010) and Imaging Hong Kong Contemporary Photography Exhibition (2008). The Cosmetics Show 04: A visitor prepares to leave while a sales waits for her at the Cosmetics Show in Hong Kong. 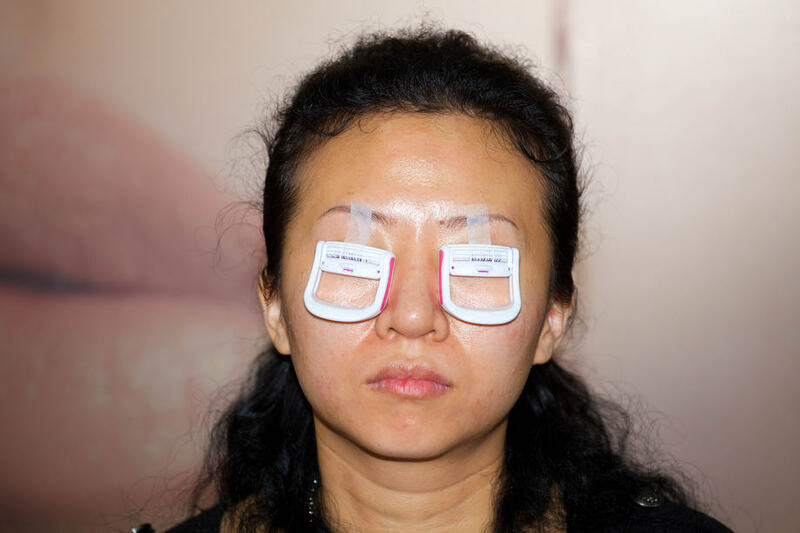 The Cosmetics Show 05: A woman receives her treatment on eyelashes at the Cosmetics Show in Hong Kong. The Cosmetics Show 03: A man tries a facial equipment at the Cosmetics Show in Hong Kong. The Cosmetics Show 02: A woman waits for her lips treaement process at the Cosmetics Show in Hong Kong. The Cosmetics Show 01: A lady receives a trial of facial treatment at the Cosmetics Show in Hong Kong.